We’ve finally been told what’s behind the Red Plan – “equity.” It means that western Duluth gets most of our poor and minority students and 263 parking spaces for Denfeld High while eastern Duluth gets a surprise $6 million stadium for Ordean High and 600 parking spaces. Our School Board has twisted the law - ignored petitions - handed public decisions to a private corporation - lied about how generously it would pay the corporation - threatened our children to renew a levy - threatened homeowners with eminent domain. Now, Board member Cameron wants to remove Gary Glass because he asks too many questions – few of which have been answered or answered honestly. This madness must end before more of our children become refugees in surrounding school districts. 325 students open enrolled in Hermantown this fall. That’s 16% of their total student body and they have a waiting list. Proctor and Wrenshall send buses into Duluth for more. Private, religious and charter schools have also become much more popular. The Duluth Schools are losing millions in state aid. 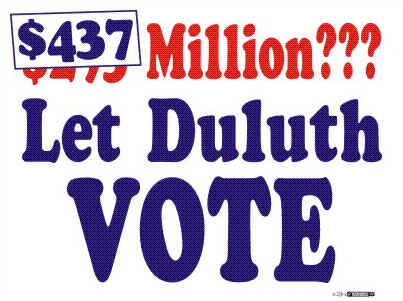 Let Duluth Vote will take the School Board to court and not for a trivial offense like ignorance or arrogance. We will take them to court for stealing our right to vote. We will seek a court injunction to stop the Red Plan until it can be put to a vote. The United States Supreme Court has ruled that our right to vote is so fundamental to democracy that it deserves special protection. Half-a-dozen other laws may also have been violated to force the Red Plan down our throats while the School Board gloated that nothing could stop them. Their boast must be put to the test. Duluth voters have spoken. This November 35,775 school district voters (69%) voted against increasing the School District ’s funding over last year’s. This overwhelming rejection was not just due to the 56% property tax increases for the Red Plan but because voters had been denied their right to vote on it. The School Board spent $70,000 threatening our children with disaster – “no school in January” - if we didn't renew the 2003 operations levy. That threat came with a promise not to use operating money to pay for the Red Plan. But once voters approved the levy the school board broke its promise and "borrowed" $5 million from school operations to pay for the Red Plan. Blackmail and deceit have no place in our schools. 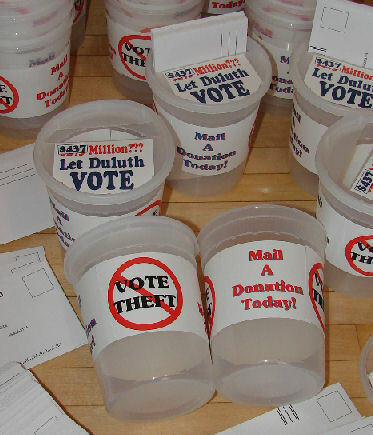 If just 5,000 of those 35,775 “no” voters sent us a $10 contribution Let Duluth Vote could stop the Red Plan in court. We only have to delay construction until the Court orders a binding referendum and/or until we elect four new school board members - a majority - in November. In 1978 Morgan Park parents took a previous school board all the way to the Minnesota Supreme Court and delayed the closing of Morgan Park High for a year. We’ll do the same. We will win. 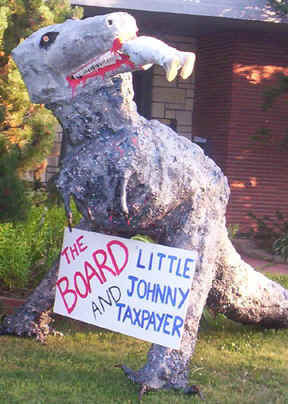 PS: Tell the School Board what you think: Superintendent, 215 N 1st. Ave E., Duluth , MN 55802 . Send a copy to the Duluth News Tribune. Only a letter will do. Email is often ignored.